Kangana Ranaut, who was recently bruised during a sword fight practice session, is now back to work. The actress, a few months back, had received a cut on her forehead during the practice session, but that did not deter the actress from getting back to work. The Rangoon actress was snapped post a sword fight practice session in Mumbai on October 10, 2017. 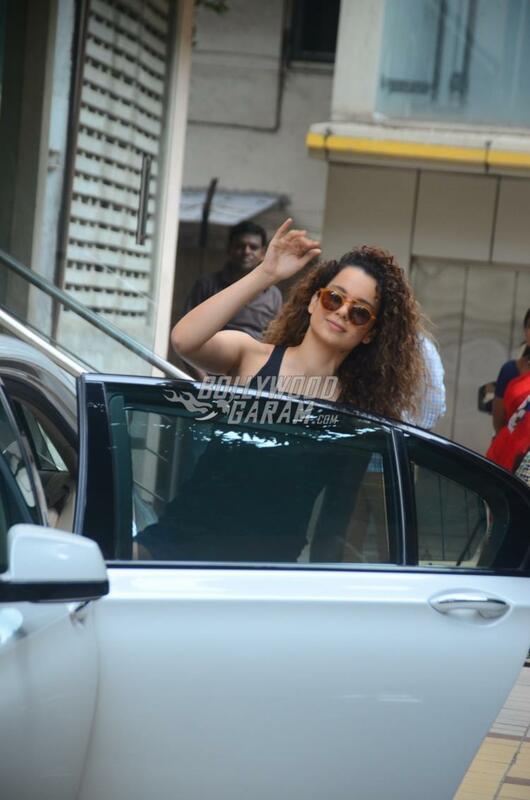 Kangana was seen in a sporty black vest top and blue shorts and waved for the cameras, who clicked her outside the rehearsal studio. The actress had posted a picture of her after the injury which showed the cut on her forehead. The Rangoon actress is rehearsing for her upcoming film Manikarnika – The Queen of Jhansi, which is a biopic of the historic figure Rani Laxmi Bai. The incident reportedly involved her co-star Nihar Pandya, when she was expected to duck when Nihar attacked her with the sword. But the timing went wrong and the sword hit her forehead between her brows. The actress was shooting at Hyderabad and was immediately rushed to the Apollo hospital. Kangana had reportedly chosen not to use a body double for the shoot and opted to do the scene herself. The upcoming film is directed by Krish and is probably the last film Kangana would star as an actor. The actress in an interview had said that she is now ready to take up the director’s seat and would act in her own directorial but would not work for other directors. Kangana is in news these days for the public mudslinging between her and her former co-star Hrithik Roshan. The matter is still in flames and the actors often indulge in blame games on the social media. Kangana was last seen in the film Simran which did an average business at the box office while Hrithik was last seen in the film Kaabil and has reportedly signed on the dotted lines for the upcoming film, Super 30 directed by Vikas Bahl. Exclusive photos of Kangana Ranaut after a sword fight practice session in Mumbai!